Los Angeles, CA and Jerusalem, Israel – The Jewish Federation of Greater Los Angeles and Unistream signed an agreement with Mayor Nir Barkat of Jerusalem to open five new entrepreneurship centers in Jerusalem over the course of the next two years, in collaboration with the Jerusalem Municipality, the Jerusalem Development Authority, the Ministry of Jerusalem and Heritage, and the Education Department of Jerusalem. These start-up accelerator centers will operate Unistream’s flagship program “Educating Tomorrow’s Leaders Today,” a three-year platform in which Unistream participants establish start-up companies with the guidance of hundreds of Israeli businessmen/women and leaders. Through the Unistream program, participants also develop social projects for the benefit of the community and develop expertise in various technological fields. At the completion of the last year of high school, the graduates will continue with the extension program “Fast Forward,” which operates with the support of J.P. Morgan and Gandyr Foundation. In the “Fast Forward” program, graduates receive support and mentorship throughout their adult lives, enabling (and ensuring) a successful integration into hi-tech and financial sectors. This is the first-time entrepreneurship centers will be opened in a major city/urban center. Until now, all entrepreneurship centers have been focused outside major cities in disadvantaged neighborhoods. As the largest city in Israel and the capital of the Country, this agreement signals the need and desire to create a strong network of centers in Jerusalem to enable broad impact across the city, as well as to engage and recruit the business community in a significant way. The agreement was signed on Sunday, March 11, 2018, in Jerusalem, detailing these new centers for Jerusalem youth, ages 15-18. The first four centers are projected to open in Jerusalem in 2018, and the fifth center is projected to open in 2019, achieving the goal that was outlined in the Federation-Unistream partnership to open 10 centers during the first three years of the partnership. 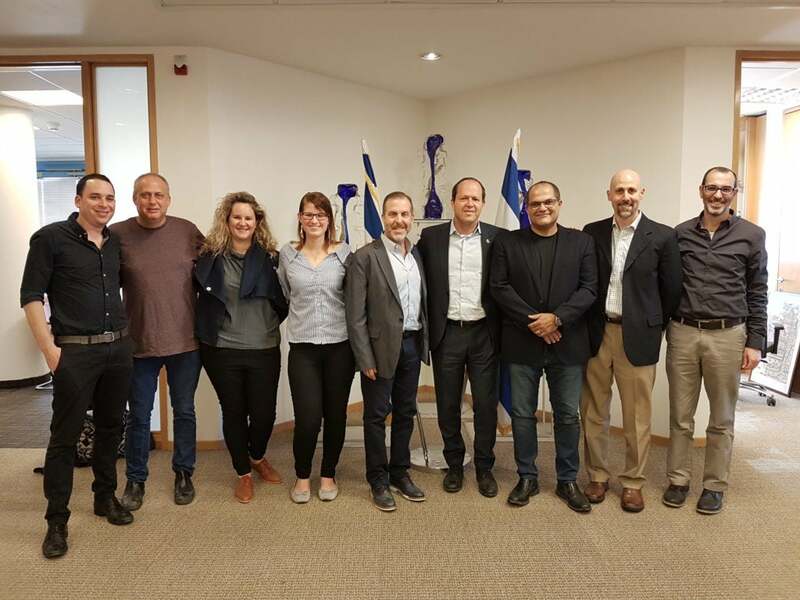 The following people participated in the meeting to sign the final contract for the commencement of the joint project: Nir Barkat, Mayor of Jerusalem; Jay Sanderson, President & CEO of The Jewish Federation of Greater Los Angeles; Aviv Keinan, The Jerusalem Education Administration’s Manager; Rony Zarom, Founder & Chairman of Unistream; and Batsheva Moshe, CEO of Unistream. Eyal Haimovsky, CEO of the Jerusalem Development Authority, stated that this is the first time that the Jerusalem Development Authority has chosen to actively participate in building of the educational infrastructure of Jerusalem, which encourages technological entrepreneurship among high school youths. The Authority, which over the past five years successfully identified the untapped potential of the hi-tech and bio-med fields in Jerusalem, developed a thriving eco-system that has brought unprecedented growth in the number of technological companies in the city. The increasing need of these companies for a skilled technologically advanced work force, prompted the Authority to invest in the field also among the high school population, together with the Education Administration of the Jerusalem Municipality. The Jewish Federation of Greater Los Angeles and Unistream announced a multi-year strategic partnership in January 2017 to close socioeconomic gaps in Israel and make the start-up dream a reality for all Israeli youth. The partnership aims to increase impact and expand the reach of Unistream in Israel. The partnership will also help scale Unistream’s activities and operations in Israel, dramatically increasing the number of Israeli youth who participate in Unistream’s cutting edge program, as well as the number of Unistream centers throughout the country. Through this partnership, the Federation and Unistream are empowering thousands of Israeli youth from underprivileged areas and equipping them with the tools for success. Unistream was founded with the mission of improving Israeli society by training underprivileged Israeli teens and young adults [from Israel’s periphery] in entrepreneurship and leadership, in both the business and social arenas. By providing these tools and skillsets, Unistream helps empower the teens and young adults to realize their potential, create their own futures, break through any limitations, and succeed in the business world, while also leading community projects to influence the fabric of the city in which they were raised. In addition, Unistream teens are exposed to youth from other backgrounds, endowing them with leadership skills for coexistence in Israel. The young adults are mentored and guided by 4,000 volunteers in the business arena, who impart their business knowledge and serve as role models for the participants. Unistream operates in 60 communities and cities throughout Israel, with over 2,000 youth and 3,000 graduates representing a cross-section of Israeli society. From Left to Right: Moshe Kaptowsky, Jerusalem Development Authority; Aviv Keinan, Jerusalem Municipality; Shira Katz-Vinkler, The Jewish Federation of Greater Los Angeles; Batsheva Moshe, CEO of Unistream; Jay Sanderson, President & CEO of The Jewish Federation of Greater Los Angeles; Nir Barkat, Mayor of Jerusalem; Rony Zarom, Founder & Chairman of Unistream; Aaron Goldberg, Senior Vice President, Israel, The Jewish Federation of Greater Los Angeles; and Rony Rosenheim, Jerusalem Municipality. For more information, please email AWeiner@JewishLA.org. To learn more about The Jewish Federation of Greater Los Angeles, please visit www.JewishLA.org. To learn more about Unistream, please visit http://unistream.co.il/.